Nunthorpe Ward Councillors are up for election in early May. 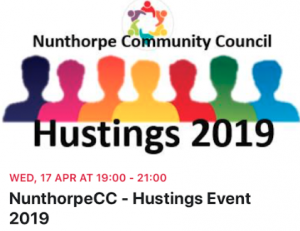 We’re delighted to support the Community Council in holding a Hustings event at 7pm on Wednesday 17th April at The Institute. All confirmed Ward councillor candidates for Nunthorpe (Mbro side) are invited to come and talk to residents. The candidates will be given a small number of set questions to answer which they will prepare for, but there will also be a public Q&A where residents can ask their own questions not already covered.